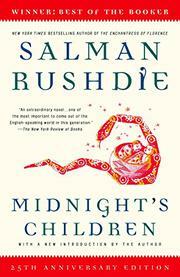 When Indian novelist Rushdie arrived with Grimus in 1979 we called him "an imagination to watch." And he'll be watched indeed once this bravura fiction starts circulating--a picaresque entertainment that's clearly inspired by close readings of the modern South American fabulists and, above all, Sterne's Tristram Shandy. Rushdie's own Tristram is named Saleem Sinai--and he is born at the stroke of midnight, August 15, 1947, making him exactly contemporary with the life of India-as-a-nation. In fact, Saleem and 580 other "midnight children" born at that moment grow up to find themselves equipped with powers of telepathic communication, foresight, and heightened individual sensoria: Saleem's particular gift is a "cucumber" of a nose with which he goes through life literally smelling change. The Sinai family, originally Kashmiri Moslems, migrate to Bombay, living in ex-colonial digs. And a switch at birth with a neighbor's baby seeds narrative trouble that flowers at different times later on in the book: opera buffa complications all the way. Saleem seems to be in the middle of all cataclysmic Indian events, too. He's present during language riots and a dinner-party coup in Pakistan (where his mother fled after a marital spat involving the revealed baby-switch). Because of his olfactory talent, he becomes a "man-dog" tracker for a Pakistani military unit during the debacle in Bangladesh. And, back in Bombay, Saleem is clapped into jail with the other "midnight children" by "the Widow"--Indira Gandhi--during the dictatorial Emergency. Rushdie swoops, all colors unfurled, all stops out, through and around his synchronic fable with great gusto and sentimental fizz. And though such a rodomontade would be shameless if made out of more familiar material, the sub-continental excessiveness (and the fascinating history lesson which is incidentally built in) keeps us loading and firing right along. Tour de force, in other words--and so, of course, a little exhausting; but, unlike other fantastical picaresques, this one is truly worth the effort. A big striped balloon of a book, often dizzying with talent.